Welcome to Thrifting Thursday, as the name implies, I’ll be talking about items I’ve either thrift-ED or have deemed interesting enough to photograph and share with you here on the ol’ blog. The thrifting doesn’t necessarily happen on a Thursday, I just thought that TH-rifting went well with TH-ursday, besides is there a better way to celebrate Friday eve than enjoying all the thrifted goodness out there in the world? On this weeks edition of Thrifting Thursday, lets focus on the kitchen, shall we? Mmm….yeah I know the cinnamon rolls aren’t vintage or thrifted, if they were that would be kind of gross. But on a non-second hand food note, notice the bowl these yummy and tight jeans inducing rolls are sitting in. That’s what we’re really talking about today. I don’t remember exactly when, where, or how this sweet little pink dish entered my home, but she gets a lot of use. And she looks pretty cute too. Those sweet little flowers make me smile every time I pull her out for the next batch of cinnamon rolls or whatever else I deem her just the right size for. She’s a vintage Pyrex, I estimate probably from the 60’s or 70’s. We have a matching split casserole and small-ish rectangular casserole dish. So, it’s the beginnings of a matching set! Exciting stuff! Now onto the good part, the cinnamon rolls. You didn’t think I’d leave you hanging on those did ya? The dough is based off of a recipe for the Pecan Caramel Rolls found on the Betty Crocker website, you can find the exact recipe for those here. Happy thrifting and baking everyone!!! I am participating in a ” 31 Days of…” series for the month of October. You see a whole bunch of sweet blogger buddies have been getting together the past few years to do 31 posts in 31 days. The topic is always something they have a passion for. This year they have invited all of their readers to post 31 days of their passions. If you are interested in participating in the 31 Days of…series, or you’re just curious about what everyone else is writing about, please visit The Nester, Jen, Melissa, Sandy, Darcy, Emily, and Emily. I hope you enjoy my series on finding treasures both vintage and of the heart. Let’s hope I can overcome my inconsistent blogging habit and share those 31 posts within the next 31 days! Apparently, things made from jadeite are in high demand. I’ve been on the look out for items with that pretty green milky hue, but they are just too hard to come by. That’s why when my Bubba came across this mug he happily paid the 50 cent price tag and gleefully presented me with my very first jadeite piece. I have yet to use it for fear of breaking it. Over the years I have become quite proficient at breaking favorite glasswares. Recently, I broke one of our vintage Pyrex mixing bowls, its beautiful leaf green shards were all over the floor. I nearly cried, not from the mess, but because I realized I’d broken something that could very possibly be older than me. Yup, it lasted over 30 years until it moved into my house and only made it a few weeks. 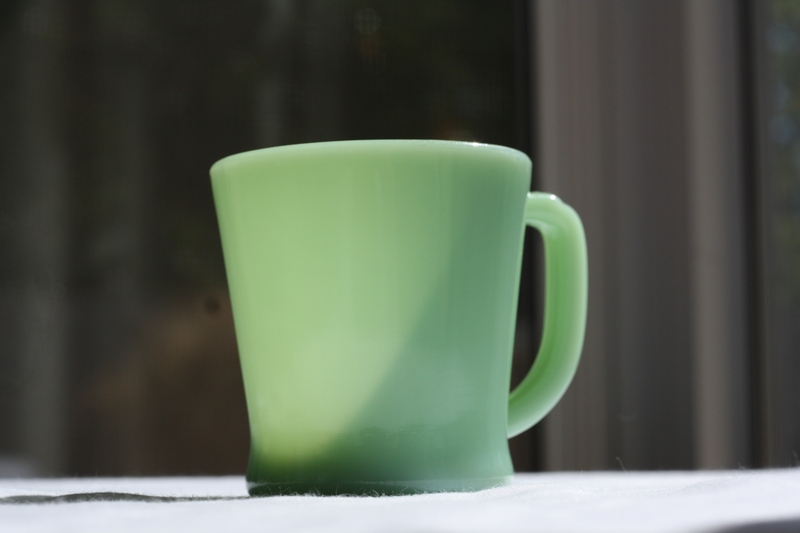 Let’s hope this jadeite mug lasts longer, and let’s also hope that I can introduce him to more of his milky green buddies!